Four very individual and talented entertainers, unequalled in their field, combine musical and vocal talents guaranteed to be the entertainment highlight of any occasion. With the ability to break down the ARTS barriers with their riotous performance, combined with compelling music, this exceptional foursome always leaves their audiences begging for more. 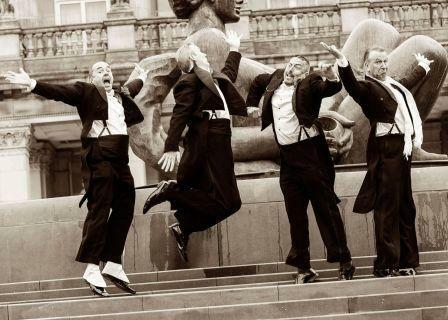 The pure talent and unique quintessential English style of The Casablanca Steps, together with authentic 3 part vocal harmonies and hilarious visual humour, are the ingredients that make them a phenomenal success. wherever they perform. By creating an amazing atmosphere combined with a shameless display of effortless team talent, these four individuals use their skills in a way that their audience will reflect warmly upon for years and years after the event! 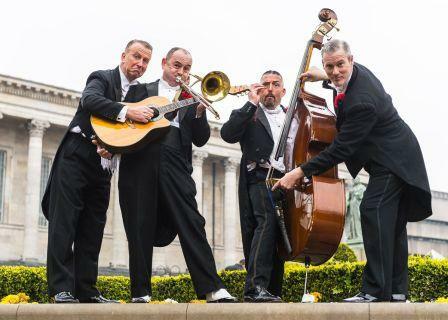 A breath taking mixture of music, song, comedy and laughter from the best Corporate Foursome in the business. For an evening of sheer indulgence calculated to appeal to the most discerning of international audiences, The Casablanca Steps are unrivalled. In a world of change, The Casablanca Steps are constantly outstanding.